Where do I use my Razer voucher code? Razer was founded in 2005, a collaborative company with headquarters in both California and Singapore. Over the years, the iconic triple-headed snake logo has etched its way to greatness in the minds of the global gaming community and esports - becoming synonymous with quality, reliability and style. Team Razer was quick to establish partnerships with champion teams of the esports community, supporting flag-bearers of the industry and encouraging its development. When shopping with Razer the pool of products leaves you genuinely spoilt for choice, so it’s best to have a general idea of what you want from a laptop or PC. Razer has a great range of powerful desktop PCs such as the Tomahawk or Tomahawk Elite; if you’re seeking something portable then check out: Razer Blade Stealth 13, Razer Blade 15 or Razer Blade Pro 17 - all available at different price points, with adjusted specifications and extras. Razer also prides itself on their fantastic range of keyboards, mouse and audio devices, in addition to other accessories - all of which can be found on their website, ready to bolster your prospective PC system. If you like what Razer has to offer then you’ll love their seasonal sale - reductions can be found to range all the way up to between 30-40% off RRP! Discounts are available across an impressive range of products such as the Razer Phone 2, Razer Blade Stealth, and the Kraken Pro V2, just to name a few. Don’t hesitate, there are plenty of savings to be had and Razer make the purchasing process a hassle-free task; easy returns (14 days no risk) and fast free shipping, taking between 3-5 business days. 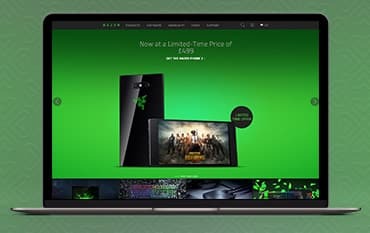 If you want a bit more bang for your buck, sign up to the Razer newsletter and receive a free £10 discount code for orders totalling £99 or more! If you’re currently in full-time education (college or university), seeking the very best kit to backup your studying, then look no further than Razer. Simply consult the Razer education page here, input your details and provide a valid educational institution email address, you’ll be entitled to a 15% off discount on selected Razer peripherals and a 5% off discount on selected Razer systems! Upon registration, the email you have provided will be the recipient of a unique Razer discount code. There is a ‘Contact Us’ form provided on the website here. What is Razer’s contact number? Razer is one of the biggest names around in the global gaming community, and it’s not just because they release captivatingly colourful keyboards and mouse devices; Razer is at the forefront of gaming technology, renowned for their cutting edge hardware, innovative software and a plethora of other services. Nearly 15 years ago Razer unveiled their flagship ‘Diamondback’ gaming mouse, establishing themselves within the industry and setting in motion years of innovation yet to come. Razer in the present day has moved from strength to strength, improving on what it does best and expanding into new areas; you can expect: powerhouse desktops & laptop devices, unrivalled PC accessories and newer innovations such as the mobile gaming phone. There are plenty of ways to save when shopping with Razer, ensure you don’t miss out on a bargain and always shop with a Razer discount code from us!